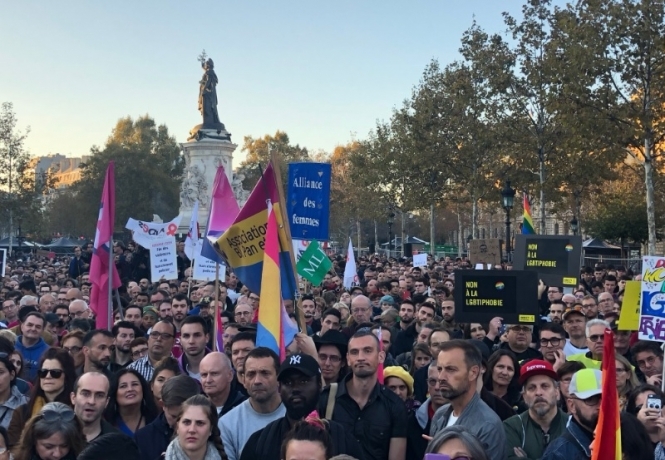 Under the slogan “Be yourself without fear”, protesters took to the streets on Sunday October 21 to call for more public safety for LGBT figures, and for more action to be taken against those who behave violently towards LGBT individuals. They also called for less judgement towards LGBT people, and for more freedom to be open about sexuality. Many ministers and politicians also joined the protest. Figures show that there is an act of homophobic violence on average once every three days in France. Recently in Paris, two men were denied transport by their Uber driver after the latter took offence at them kissing in his car. The driver is alleged to have stopped the car suddenly and forced the men to get out because “he did not drive people ‘like them’”. Joël Deumier, president of action group SOS Homophobie, said that a “national campaign” was needed to raise awareness of anti-LGBT speech and aggression. Guillaume Mélanie, president of the group Urgence Homophobie - an association that helps LGBT foreigners who face danger and prosecution in their home countries - was also present. Just last week, he was hit in a homophobic attack while coming out of a restaurant, which broke his nose and left him very “shocked”, he said. He said that the march symbolised “freedom of speech”. Two LGBT protesters, Olivia and Philippine, told the Agence France-Presse that they had suffered “verbal insults” in the street and other prejudice. Paris mayor Anne Hidalgo this week called for "a collective awakening" on the issue, and called a meeting with representatives from the chief of police, the Paris public prosecutor, and the Interministerial Committee Against Racism, Anti-Semitism and Anti-LGBT Hate (DILCRAH).